At the end of the year, it's traditional to look ahead into a new year and make some resolutions. For those of you who are interested in innovation, here are some resolutions to take with you into the new year. Our innovation team will ensure our work is aligned with and supported by the senior management team. We'll stop worrying about making it perfect and just do something radical. Now, I don't expect that everyone will be able to adopt all of the resolutions on this list, but if you read through and decide you can implement even just a few of them, you'll have a much more innovative 2008. And, realizing that most resolutions don't last through January, if you are serious about making and keeping these resolutions, put them on the corporate website or the innovation portal where you work, so that your teammates and executives can be reminded and hold your team accountable for the important work you do in innovation. Here's to an even more innovative 2008. As everyone knows, imitation is the sincerest form of flattery. But where innovation is concerned, imitation just means that your firm is adopting a strategy of at best a fast follower. If the idea already exists in your industry, you've missed the innovation window and are now playing catchup. So, what's your strategy? Are you comfortable being a (hopefully) fast follower? If so, your copy and replace capabilities had better be well honed, cause there's a lot of people who intend to compete for this position. If you intend to innovate or disrupt, then the question is - what are you doing to scan other markets for great ideas that can be implemented in your market, or to identify unmet needs that you can satisfy to disrupt another market? Imitation is a simple but dangerous approach, because it places your organization on a passive footing. Simply waiting for someone else to create a good idea then rapidly copying it assumes your copy capability is the best in the industry. Actively scanning the adjoining and adjacent markets for ideas that you can adopt, and seeking opportunities for your firm to act as a disrupter, require an active footing and investment in people and resources. It will require you to enter markets quickly, without a complete risk assessment. Yet, as my military friends like to say, fortune favors the bold. So, what's it going to be? A relatively safe and simple fast follower strategy, with little risk and little reward, or an active, aggressive strategy to seek out the best ideas from any source, and identify opportunities for your firm to act as a disrupter? Imitation may be the sincerest form of flattery, but few leaders ever get where they are by imitating others. Rather, they create their own unique reality. Innovators aren't imitators. In most firms, it's fairly easy to find people who want to generate ideas, and relatively easy to find people who will champion ideas or evaluate them. Once a process is defined, you can build a team or group of resources to help manage the evaluation and eventual handoff of ideas to a product development team or services group. The task that everyone agrees SHOULD be done, but you find very rarely, is the task of identifying trends and putting those trends into context for team members to understand. On the surface, this sounds like an easy job. All a person has to do is start identifying demographic, societal, industry and technical trends and competitive actions and documenting them, to present a picture of what's likely to happen in the market 2, 3 or even 5 years down the road. This gathering and synthesizing of trends seems like an easy, yet interesting job. Yet, many of the firms we've worked with don't have a person in this role - often they don't even have the role defined. I've often found it strange that innovation is supposed to create new products and services that will position a firm as a leader or will disrupt a marketplace, yet most firms don't have any consistent ability to look more than 9-18 months down the road to determine what they'll think will happen next. Yes, I know many firms have longer product roadmaps than 18 months, but that is an internal projection of a known product or service. Very few firms do a good job understanding and synthesizing trends that are out of their control and determining how they can react to or shape those trends to their benefit. Many times we are called on to help firms generate ideas. Usually we'll want to know the context - what opportunity are we addressing or problem we are solving. Usually someone can provide a reasonably coherent answer. Next, we'll ask what competitors are doing. Occasionally we'll get some answer, usually uncertain and murky. Then, we'll ask if there are any trends in the market that will impact the ideation or results. That question usually results in blank stares. An innovative firm understands the trends in its market and in complimentary or tangential markets and uses those trends to guide new product introductions, new services and new business models. It's not enough to merely project your existing product or service line into the future - using assumptions you can't control. You must understand what your competitors are doing and what significant trends are unfolding and use those as part of your innovation initiative. Otherwise you are innovating in the dark. There's an interesting article in Portfolio magazine this month by Andy Grove. You'll remember Mr. Grove as the person who drove Intel to its prominence and who wrote the book Only the Paranoid Survive. Andy's article is focused around advice he is giving to the leaders of Wal-Mart and GE about opportunities to disrupt health care and the automotive industry. Andy argues that Wal-Mart has an excellent opportunity to disrupt the way health care is delivered, and that GE has an excellent opportunity to disrupt the automotive market based on electric engines. Here's the point - there's potential in any business to produce new products and services in line with your core business models, or to tweak the business models where your firm already participates. In many cases this innovation will be "incremental" - it will be copied. The first innovator is the leader of the pack, and many firms will work hard to catch up. A good example of this phenomena is new touch screen phone from Verizon, which looks strikingly like the iPhone from Apple. Now that the market is catching up to the base iPhone, what will Apple's response be? 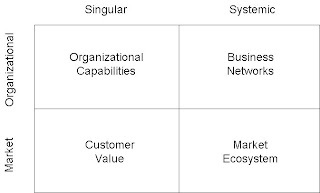 What Grove is pointing out, however, is that while real disruptive innovation and change can become very difficult for larger firms, since these firms have so many products and so many competitors in their "home" markets, disruptive innovation in other markets or segments may be actually more beneficial and easier to accomplish. Wal-Mart has stores in many small cities and towns across the US. What would happen if you could acquire health services and your pharmaceuticals in Wal-Marts - or even if the doctors and nurses were Wal-Mart employees? Wal-Mart has a long standing and well deserved reputation for keeping costs low. It's ubiquitous stores provide easy access to many people and great convenience. Wal-Mart could significantly disrupt the delivery of non-emergency healthcare if it so chose. GE, with its investments and knowledge in power generation and engine technology, has several real rationales for entering the market for electronic vehicles. First, it stands to benefit from the use of more electricity generation and distribution, and second, it has knowledge of engine technology. GE, if it chose to enter the market for electronic automobiles, could create quite a difference in that market. The point being that many firms have capabilities, insights and technologies that would allow them to enter and disrupt other markets if they were to combine those skills and choose to attack. These moves will create disruptive change, since the moves will upset the standing order. When your organization decides to innovate, it should consider the possibilities within its own products and markets, and those opportunities to leverage internal capabilities to disrupt a different market segment as well. I've had the good fortune lately to get to read a lot of new books on management and innovation, courtesy of the authors and their publishers. I've just finished a new book that will appeal to a number of innovators, especially those pushing their organizations to take on bigger, risky new projects. The book is entitled Big Think Strategy and is by Columbia business school professor Bernd Schmitt. Obviously, Small Think is the opposite of these concepts - safe, conservative, incremental, stovepiped and short term. So far, sounds a lot like other innovation books. Schmitt uses GE and Jeffrey Immelt as an example of a firm that moved from traditional Small Think to Big Think. Immelt realized that GE could not grow quickly enough without innovation and Big Think, and challenged his direct reports to create three Imagination Breakthroughs each year. These are radically new ideas that must generate at least $100m in growth. Immelt regularly reviews these ideas and has set aside funding for these new ideas. That's putting the management talk into action. Each of these tasks is covered in a short chapter in the book. For those who are familiar with innovation or disruptive thinking, the first chapter will reinforce a lot of reading and research you may have done. As far as evaluation is concerned, Schmitt's advice is to first ask - is it a Big Idea, then look to see if it is feasible. In the chapter on turning ideas into a strategy, Schmitt offers a framework for identifying how the innovation you've identified can be put into practice. 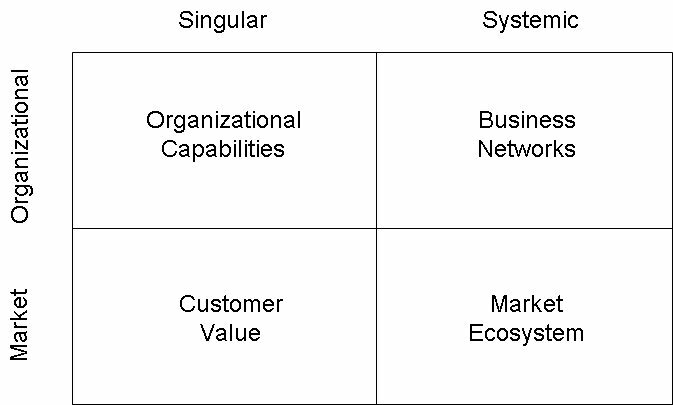 Like most MBA style analysis, it's based on a two by two matrix. Transcendence offers something far beyond what has been expected. Opposition offers something that seems in contradiction to the expected order (producing the Mini when the prevailing auto choice was an SUV). Essence is reducing to the indispensable offering and having full control over those indispensable factors. Integration is bringing together concepts that were considered mutually exclusive. These actions provide the basis for choosing which Big Think Strategy will work best in your situation and competitive landscape. The last two chapters of the book have to do with leading and sustaining a big change program. As you might expect, these actions require leaders with big visions and thick skins. They need passion for the Big Think Strategy and need to work not only with the quantitative data, but also with their gut instincts. It's hard for a consultant or a book to define all of the steps necessary to implement such a strategy, and what's really required is the dogged determination to stick with the program, what Schmitt calls perseverance. I found this to be a great book to motivate any innovative thinker, but it is targeted at the senior executive leaders of the firm. Only they have the ability to engage and create dramatic change as is described in this book. One small quibble with the book is that it really doesn't address the cultural changes that would be necessary to make the types of changes Schmitt suggests are possible actually happen. Probably the largest barrier to the types of ideas Schmitt promotes are internal and bureaucratic. No CEO, no matter how visionary or how passionate, can overcome a conservative, slow moving, risk averse team without dramatically impacting the corporate culture. This book belongs on the desk of every CEO. It's not just for those who want to change, but also for those who think change may be necessary. It has some excellent examples of organizations which have implemented a Big Think strategy and have succeeded in changing their business. It is a good book for advocacy of innovation and significant change for those firms mired in small, incremental changes who are rapidly losing ground to firms that are more aggressive and willing to take on more dramatic change.